3 WHAT ARE THE BENEFITS OF USING BUFFERS? There are many tasks that are done around your home which are very tedious to do by hand. One of those is waxing your car. This chore has left many people over the years with sore and aching arm muscles. Fortunately, if you spend a few dollars on a buffing machine you do not have to do this task by hand. What is the best car buffer you can buy? In this article, we will take a look at several good ones and also point out the characteristics of a car buffer that makes it a very good one. Quite simply put, Dewalt is a proven name when it comes to power tools. You can buy their products with confidence because they are known to stand by what they sell 100%. This is one of our favorite buffers out of all of those we tested. It is very powerful and fast but also built in a way that has it all under control. This buffer features such things as a variable speed trigger, a powerful 12 amp motor and can work at speeds up to 5000 RPMs. Definitely, worth the price you pay for it, we think. We really liked the soft start feature that this Dewalt buffer has. It makes it nice because it does not throw your wax and polish all around before you get it to where you need it. This thing also runs very smoothly even at the higher RPM settings. The soft start has a little bit of a downside too because it can be a little bit ‘jerky’ at times but you will adjust to it. Like many of the buffers that are made today, this one is slightly to the heavy side too but it is very powerful also. This is a really high-quality car buffer from Flex. It will help you easily shine and buff and vehicle that you own and leave it looking showroom new. It is jammed packed with features that make the task of buffing go fast and leave you with impressive results too. This is called a dual action orbital polisher because it does not just go in circles; it is actually made to imitate the movement of a hand when polishing. It is also very powerful and works at speeds up to 480 rpm and higher depending on the surface you are working on. We really liked how easy it was to use the various functions on this buffer. Everything is placed right near your hands so it does not take much effort to do such things as changing the buffer speed. The unit itself accelerates with a gentle push of the trigger next to your fingers too. We liked most everything about this buffer and it is truly a professional style buffer; unfortunately, along with that quality comes a pretty high price tag too. Some users may also find this buffer a little to the heavy side for extended periods of use. You would be hard pressed to find a name more associated with quality when it comes to power tools than Makita. This fine buffer made by them is certainly no exception. 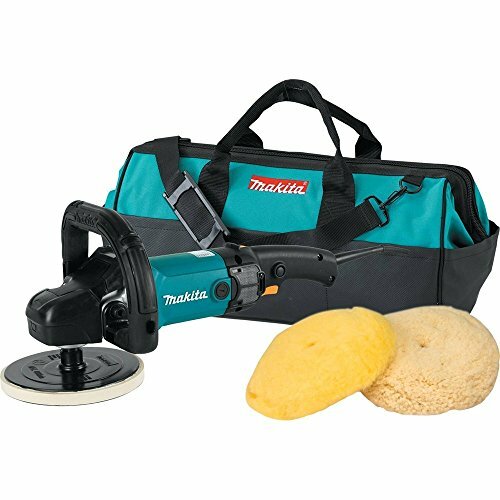 It makes quick work of any buffing or polishing jobs that you have to do and it does it for an affordable price. It has such great features as a soft startup, constant speed controls, and a variable speed trigger. This buffer from Makita is also very ergonomically designed which makes it comfortable on your hands as you use it. This is not a bargain basement priced power tool by any means but its price point is exceptional considering what t does and who makes it. We also really liked the constant speed control that is built into it too. One of the big problems with this power buffer is the fact that it is one of the heaviest that we tested. You will learn how to adjust to the weight but it may bother some people with prolonged use. On the nitpicky side, we are surprised Makita did not include the size wrench needed to change the buffing pads. 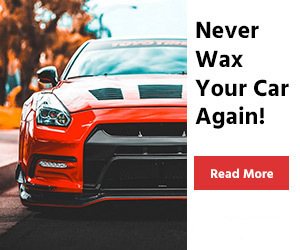 Here are few companies that know polishing and polishers as well as Meguiar’s; after all, they are known for making the best polishes and waxes you can buy. Their input into the manufacturing and design of this polisher is key to what makes it work so well. It even can be bought for a very reasonable price. This buffer uses it generous 5800 RPM speed to make both waxing and polishing with it very easy. It is also very ergonomically designed and well-balanced. We really like the way this buffer self-adjust its power to keep the buffing pads spinning at a constant rate. It really helps the finished job look fantastic. The fact you can move the top handle also makes it a very comfortable buffer to use. It’s a lighter buffer than many of those on the list too. We thought they could have done a little better job with how they installed the power cord on this buffer. We can see some durability issues down the road with it. Also, if you are doing buffing jobs that require constant pressure down, then you will want a bigger and more powerful buffer. 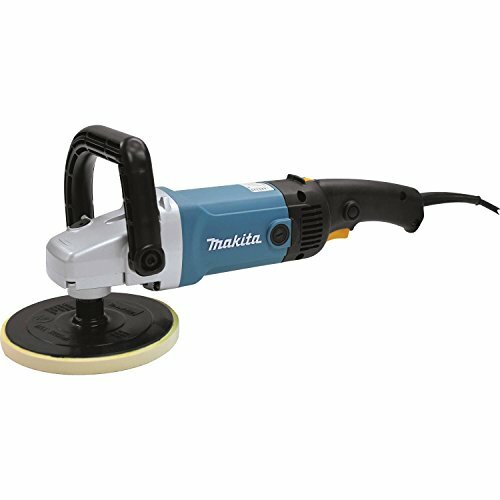 Here is another Makita buffer that is so powerful it can also be used as a sander. It is great for those people that take on a lot of auto jobs that include a large amount of bodywork. It is reasonably priced for all you can do with it and you get the strong backing of the Makita name too. It comes complete with an adjustable D-handle and Makita even made it with a 3 prong plug to help eliminate static build up as you work. The variable speed dial on this polisher/sander works really well. It makes it nice to know exactly where you have to set the buffer speed to when doing similar type jobs on a regular basis. We also liked the fact that it’s very easy to go from standing to buffing with this power tool. This buffer is a little bit noisier than many of the other buffers on our list. 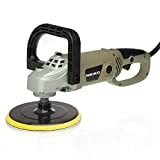 Also, if you are using it in a dual capacity as a polisher and a sander it is a great purchase but if you strictly want to buff with it then you should get a buffer that does not have the sanding feature too. Porter-Cable adds another trusted name to our list of companies that are known for producing great power tools. 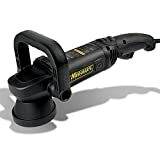 This dual purpose sander/buffer is great to have at home or around any auto body shop. It is also one of the most budget-friendly buffers on our list. 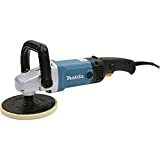 It easily converts from being a good sanding tool into a handy polisher. This power sander/buffer also has a removable side support handle and can generate up to 6800 OPM with its powerful motor. We all felt the price point on this model was outstanding. To get a tool backed up by a strong name in the industry at an affordable price is a big bonus in our eyes. The fact this buffer has a random orbit to it was a very nice feature also that will help eliminate swirl marks. There is a chance of some drive shaft issues on down the road as you use this model buffer/sander. We also thought the way it was designed it got a little to the heavy side as it was used. Here is another fine Porter-Cable power toll that is just designed to function as a buffer. It does a great job making any car’s paint look much more vibrant and shiny. This fine polisher also has a very affordable price point too. Nice job on the design here by the folks at Porter-Cable. It has such outstanding features as a generous 6800 OPM speed, a multi-position side handle and a really nice ergonomic design. This tool is very easy to work with. 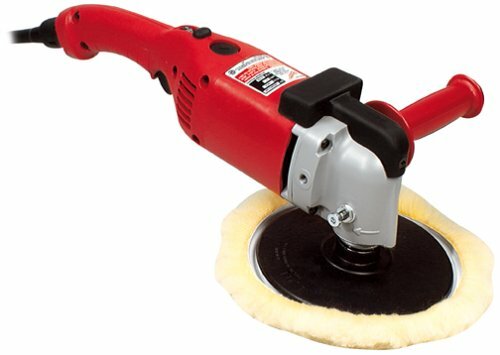 It can also handle a variety of different size buffing and sanding pads. The variable speed feature on it works extremely well in our opinion. It makes it nice when doing different types of buffing and polishing. It is a very compact and lightweight design too. We can see some potential durability issues here with a tool in its price range but its 3-year limited warranty helps ease this concern a little. At higher OPM’s we fill this buffer vibrates a little too much. This is a very high-quality buffing product that Milwaukee Tools has produced here. It is powerful and has a lot of features that make it very simple to use. The price is attractive to given the company that manufactures it. We all liked the design of this buffer/polisher very much. It has such great features as a trigger speed control, quick change pad setup and a design that makes it very comfortable to use. Add in the fact that it has tons of power and a generous 2800 max RPM speed and you have a very nice product here. We really liked the power that this polisher/buffer has. That is due to the fact that it has a full 11 amp motor powering it. There is no lag in RPM’s even when you are doing tough jobs where a lot of pressure is placed on the buffing pad. Some people will probably like the fact that the cord is detachable for storage but we were not big fans of it; this seemed a little flimsy when attached. The thirty day trial period is nice but there is not much of a warranty after that. Neiko is not the most well-known buffer manufacturer on our list but they have made a very affordable product here. It is definitely a budget friendly product that works pretty decent for what you spend on it. It is priced so just about anyone can afford to own a buffer. It has 6 preset speeds built into and rotates at a generous 3000 RPMs. It features a very ergonomically design that rivals more expensive buffers and also has a Velcro-based pad attachment system. If you do not want to use your buffer professionally or on a regular basis then this might be the buffer of choice for you because of its outstanding price point. It is the most affordable buffer/polisher all of the ones that we tested. Sometimes you get what you pay for and that seems to be the case here. This is only a model you want to buy if you will use your buffer just occasionally. There are definitely some durability issues here. Also, there is no variable speed device built into this buffer; it just has six preset speeds that it will run at. Here is the second of the orbital buffers we really liked for the price you pay for them. This one is designed and built by a company called Wen that is making a name for itself in the light duty power tools market. This 10-inch buffer works really well. 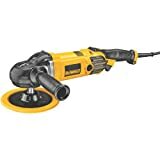 It has a generous RPM speed of over 3000 revolutions per minute and can handle all different types of buffing and polishing tasks. It features dual grip handles and uses advanced random orbital technology also. For one thing, you certainly cannot beat the price point of this buffer for how nicely it works. 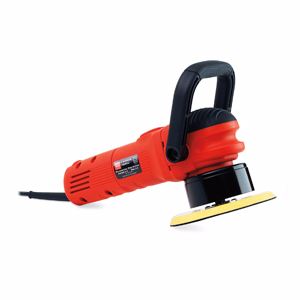 This buffer/polisher is also built so it is extremely sturdy and durable; it has a very impact resistant material that it is built out of. It comes as part of a nice buffing kit too. If you are doing buffing or polishing that requires you to apply pressure on a regular basis then this is not the buffer for you. It is strictly for handling ordinary buffing and polishing tasks. This is Griot’s Garage latest and updated polisher that will give you excellent results when polishing and waxing. The price can easily fir your budget, especially when you see what this dual action tool can do. The product is really powerful with its 6800 maximum orbits per minute and 6-speed settings. 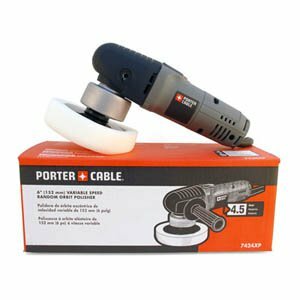 This particular polisher comes with a 10-feet power cord which we believe can be enough for your projects. Also, the manufacturer gives a lifetime warranty for the unit. The improved ergonomic design is the thing we really liked about this product. You will see that the key places where your fingers stay are made for easy and steady grip. There is a grip notch at the front to rest your fingers while holding the rubbed handle. Moreover, you can adjust it in 6 different positions for extra comfort of your hand and easy hold. With 850 watts and a 7-amp motor, this product will surely make some noise. However, we found that while working, Griot’s Garage polisher can be extremely loud. 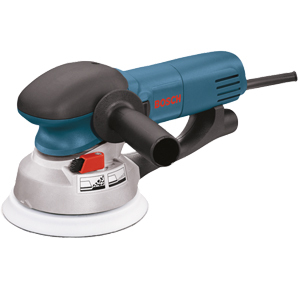 Bosch is again in our reviews with even a more powerful and reliable product for your polishing projects. It comes with many features as well as convenient design and a 1-year guarantee. Also, the unit operates with 6-inch pad size and 3/16-inch orbit diameter. You will really appreciate the fact that it does not vibrate and wobble as much as other products on the market thanks to its die-cast aluminum housing. The 6.5 amp variable speed motor and the 2 sanding modes are among the things we liked about this product. You can choose to use either the turbo mode or the normal orbit sanding mode depending on your needs. In addition, the aggressive sanding is 5 times bigger than the rate used for the other mode. That said, you can control the pressure against the surface you are working on and get the finish that you aim at. Such top quality product does not seem to have any other drawbacks except for its price. We think most people will be pushed away when they see how much it costs. 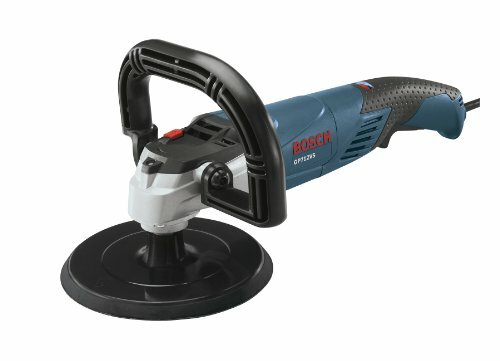 This is a really good polisher that the reputable Bosch Tool Company has made. 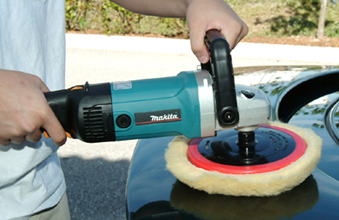 It even angles slightly to better help you do different types of buffing or polishing jobs with it. It is one of the better-designed buffers on our list as far as how versatile it can be when you are working with it. It has such outstanding features as a locking variable speed trigger switch, a fully adjustable d-handle grip, and a powerful 12 amp motor. It really is a great buffing product to work with. The best thing is how comfortable this tool is to work with even when using it for long periods of time. It is very ergonomically designed and the vast amount of position adjustments adds to that too. It is even fairly lightweight for the amount of power it has. This product seems a little bit loud to us and we think it will be annoying to some users. It also does not have any type of soft start up and can be a little messy at times. None of these were deal breakers for us but something you might want to consider before purchasing it. Our list would not be complete if we did not include some fine orbital buffing products too. That is why we included this fine orbital buffer from Kawasaki on our list. 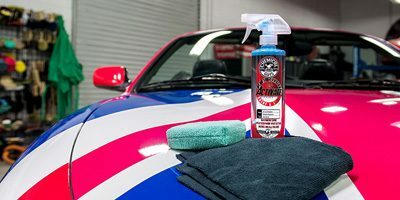 If you are looking for an inexpensive way to keep your car’s exterior shining, then this just might be the right product for you. 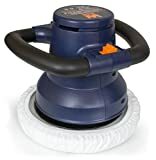 It has nice features such as a high 3200 RPM buffing speed, a two-layer foam pad and a motor that is almost a full amp in power. This is a great product to save you a lot of hand work when buffing or polishing your vehicle. This device was really simple to use and there was no discomfort even after several hours of buffing with it. Their unique design is also very ergonomic, to say the least. Kawasaki’s orbital buffer is also surprisingly very quiet when using it. There is the potential for some durability issues on down the road with this type of buffer. The drawstrings on the bonnets have a tendency to repeatedly get in the way when using this buffer too. Take a close look at the power of an electric blower that you are thinking about purchasing has. You will need to know the number of amps the buffer motor generates and the number of RPM’s or OPM’s it produces too. To wax or polish a vehicle whose exteriors in good shape you don’t need a lot of power. On the other hand, a car exterior that has a lot of scratches and swirl marks on its paint job will require a higher powered blower to get it to look nice. Waxing and polishing your car can be very tiring, to say the least. You don’t want this to be compounded by using a buffer that is not very comfortable to operate. You want your buffer to have adjustable handles and to be very ergonomically designed. This is especially true if you know you are going to be polishing and buffing for long periods of time. Look for characteristics of a blower that makes it easier to use. These include such things as variable speed controls, easy access trigger accelerators and soft start capability. You also want the buffing pad changes to be easy to do. You can by a buffer that just polishes and buffs but there are some of these that do other things too that you may want to consider. A good example is the buffers on our list that double as a handy body sander too. Your buffer is going to be put into all types of adverse conditions as you use it. That is why it is nice to have a long-lasting warranty on the one you purchase. So make sure to check out warranties before you buy. WHAT ARE THE BENEFITS OF USING BUFFERS? There really is a large selection of car buffers available in the power tool marketplace. 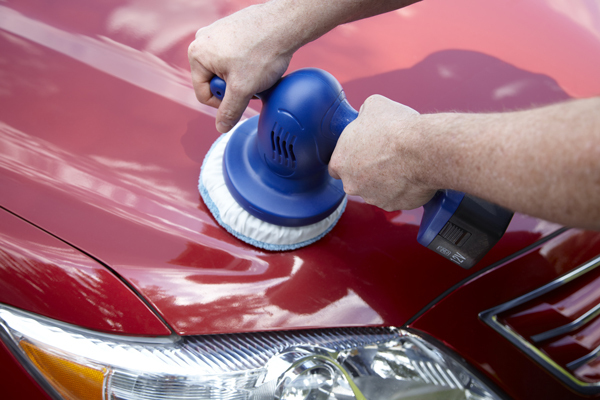 We have taken the time to review some of the best car buffers that you can buy. 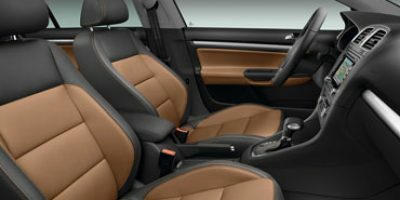 If you take your time when searching for a new buffer, take our advice on what to look for in them and compare apples with apples, you should easily be able to find the right car polisher for handling any and all of your car exterior beautification needs. We hope you enjoyed the car polisher reviews!